Twenty Four tiny Christmas ornaments to delight your holiday spirit. These tiny ornaments can be made up in no time. 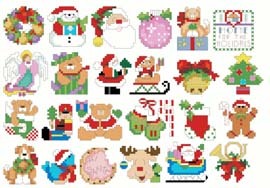 They can be made into special gift tags, cards or ornaments for a small Christmas tree. All sorts of holiday motifs can be found here.